Provide your horses and cows water through the winter by placing the K&H Ultimate Stock Tank Deicer in your stock tank. This durable, metal and plastic unit keeps a bit of water free of ice for your livestock, ensuring they can easily remain hydrated. The innovative design of this hardy piece allows it to be used either submerged or floating, for versatility in placement. Using 250 Watts of power, this deicer can be placed in stock tanks from 30 to 150 gallons, and its plastic body is safe for both plastic and metal tanks. The red, plastic casing ensures the item remains visible in your tank, and the top ring allows it to float with ease. Unscrew this section from the enclosed heating element to submerge the piece, so its five feet rest on the base of your stock tank. Its 7' long cord sports a plastic, spiral protector to keep animals from chewing on it, and this may be moved along the body of the cable for just the right placement. 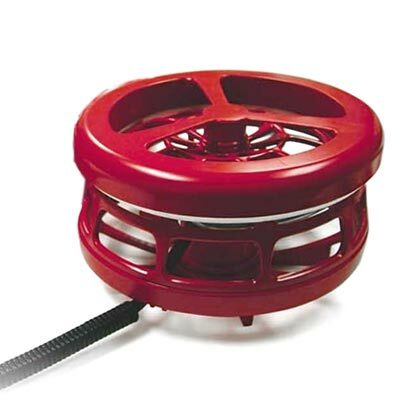 A red, plastic cord clip secures the cord to the edge of your tank, and the red cage around the heating element keeps your livestock safe. This deicer is thermostatically controlled, operating only when necessary, and may be fully disassembled for thorough cleaning if needed. Ensure your livestock have water even on the coldest days using this Ultimate Stock Tank Deicer. Two year limited warranty.